1. Place the chicken, bacon, thyme, tarragon, celery and leek into a large saucepan. Cover with water and bring to the boil. Skim any foam that rises to the surface and simmer the ingredients for an hour. 2. Pour the cooking liquid through a sieve, reserving 600ml. Pick out the chicken and ham and keep to one side. Pour the reserved liquid into a saucepan, place over a high heat and reduce the liquid by half then take off the heat. Stir the soaked gelatine through the reduced liquid until totally dissolved. 3. When cool enough to handle, strip the chicken from the bones and tear into strips. Pick out any obvious chunks of fat from the bacon, roughly chop and add to the chicken along with the chives, parsley and season. Pour the reduced cooking liquid in with the meat and mix the whole lot together. 4. Line a 900ml loaf tin with clingfilm and spoon in the meat mixture. Cover and place in the fridge for 4 hours. 5. When ready, mix the Dijon mustard, gherkin, capers, vinegar and rapeseed oil. 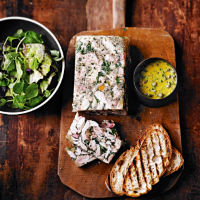 Remove the terrine from the fridge, slice up and serve with toasted bread, the dressing and a little side salad. This recipe was first published in Thu Oct 01 09:25:00 BST 2015.